Details: The article gives a good background on the business intelligence and data warehousing market and indicates how open source solutions is revolutionizing it. It analyzes the business cases in terms of choosing the right technology and shows how Infobright can be used with MySQL to help implement large data warehouses using the column-oriented design. From a MySQL point of view, Infobright is just another storage engine (instead of MyISAM for instance) so the interface is really the same. Infobright still requires a separate installation, but it installs very simply and the engine is less than 20MB size. 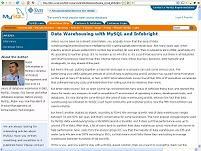 The article also provides a step by step instruction on how to create a basic data warehouse example and there are direct download links for InfoBright and MySQL.